Orange Sulphur butterflies were ‘very common’ those 27 years that I lived in Pittsburgh. That meaning that my well-stocked garden might have a many as 4 or 5 Orange Sulphurs visit on a sunny summer day. They’d be seen on the zinnias, salvias and hosta in bloom. In summer 2017 I relocated to Georgia Piedmont region. I’d visited Eatonton and its environs in 2015, 2016 and 2017 and I already knew that the Deep South had lots and lots of butterflies. My main destination was Virginia’s Butterflies & Blooms Briar Patch Habitat, it in the center of Eatonton. When you spent mornings there, as I did, you’d enjoy 20 or more butterflies like this one, a male Cloudless Sulphur, all busily flying from flower to flower. This one is enjoying the sugary nectar of a Mexican Sunflower (Tithonia) bloom. As Virginia says, plant their hostplants and they will come. I did just that, in the closing months of 2017, last year, and now again in young 2019. What happened last year, 2018? Last year I had, on any given sunny day, 10 or 15 Cloudless Sulphurs in my garden, at any given time. What’s that word, Ubiquitous? These large yellows are almost everywhere, from 8:15 A.M. to 8 P.M, nectaring, flying, resting, mating. They have several flights each year, and all this without any Senna (their hostplant) yet, in my garden! You almost have to work to remember that just because they are common, does not take away from the acknowledgment of their own unique Beauty. It reminds Boy Brooklyn of those many years when I worked in Midtown Manhattan, New York. The morning, lunchtime and late afternoon sidewalks were so packed with people, that you soon no longer notice individuals, you just saw masses of people. That, always struck me as unhealthy for the psyche, and I longed to correct that, for me and my Happiness. I finally did, and here I am, mobbed by Cloudless Sulphurs, and enjoying it. At night in bushes, perennials and trees? I’m not sure I can count all of the perils that butterflies face: ants, beetles, lizards, spiders, birds, snakes, assassin bugs . . . . During the day this same list balloons, with legions of additional predators that prey on butterflies. When you run wingedbeauty.com, and are at the Butterflies & Blooms Briar Patch Habitat here in Eatonton, Georgia so many of these predators are met in real-time. Now, you know that images of a predator preying on a beautiful butterfly immobilized, make many cringe, darken their mood instantly. I have long thought about the urgency of helping interested people learn about butterflies. Habitat disappears by the minute, pesticides and their ilk kill, and long ago I thought about how the USA”s millions of pristine, grass covered gardens deter butterfly survival. We discussed this back in John Adams High School in South Ozone Park, New York, in the 1970’s, on a much simpler level. With Doug Tallaway’s book, I personally understood. wingedbeauty.com is a platform to share, see and understand. So, when I stood there, and saw this Cloudless Sulphur butterfly in the web of this Black and Yellow Argiope spider, maybe 4 seconds after the Cloudless took a sad turn in flight . . . I first wondered if y’all had the stomach for this very natural scene and I knew I’d have own debate some time later, post it or not post it? Every day, new, new. I can’t say that I was getting used to that mini-jolt, when after decades of seeking, you come upon a butterfly you’ve never seen before. This Large Orange Sulphur butterfly was taking a brief break from what male sulphurs do (fly continuously, until they find a female, even if that takes hours to do). We were in the National Butterfly Center in Mission, Texas, some less than 2 miles from Mexico. Did I also meet my first Orange-Barred Sulphur that Texas week? No, but I remember that day at Raccoon Creek State Park in southwestern Pennsylvania, when I have almost no doubt that I startled a vagrant Orange-Barred Sulphur on a trail I followed one morning, in, 2005 or 2006. 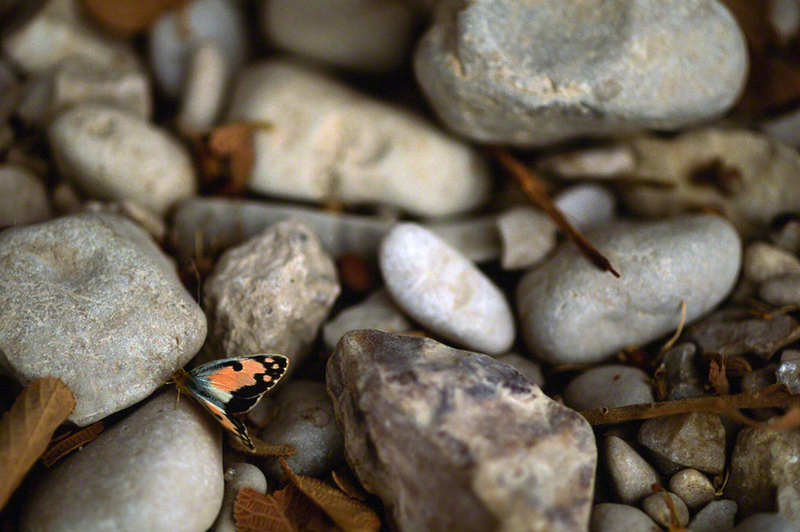 Sitting here, studying this image of a fine Sleepy Orange butterfly, leaves me looking forward. Looking forward to returning and walking through the squadrons of these perky little sulphur butterflies, in the Butterflies & Blooms Briar Patch. There were times there when I got this crazy thought? How many Sleepys are flying in the +/- 2-3 acre Briar Patch Habitat? Good that I have some sense, for these golden-orange butterflies are in near constant motion, and the fool who tries to count them, without sophisticated quadrant tools, will only find frustration. They are flying everywhere there, and anywhere there, and crisscrossing constantly. Sennas and other of their hostplants have been planted here in abundance, thus the crowd of Sleepys ever present. They not only keep me awake with questions of their number, but I spend some time trying to find a better name for these medium-sized happy fliers. ‘Sleepy’ really is not a good choice of name for them. I’d bet that some of you who know this southern butterfly (I’ve never seen one in Pennsylvania, New York, Connecticut, etc.) could/have a better name for these very serious, more focused cuties.